Two opposing bellows combine maximum sensitivity and vibration resistance with moderate cost in the Series DP differential pressure switches. Both set and reset points are easily adjustable through non-interactive, externally accessible controls. Visible setpoint indicators simplify changes. 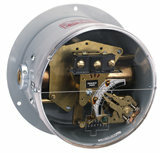 SPDT snap action or mercury switch, 316 stainless steel or brass bellows, flanged steel housing. Rated pressures to 600 psig. NOTE: Mercury switch units are not CE approved.